We thought it would be worthwhile to have it select and analyze a number of targets around the rover while it is parked over the holidays. There’s no holiday on Mars. While many of us earthlings will spend the final days of 2017 taking a break from work and relaxing on couches or ski slopes, the ChemCam instrument aboard NASA’s Mars Curiosity rover will keep busy—all on its own. Using its autonomous target-selection software, ChemCam will pick rocks to “zap” for chemical analysis. Curiosity is currently exploring an interesting portion of Vera Rubin Ridge on the lower slopes of Mount Sharp. At four miles long by more than 120 feet high, this ridge is easily seen from orbit, and in fact was observed by orbital instruments to be enriched in hematite, an iron-oxide mineral. Scientists are trying to understand the source of this hematite and the origin of the ridge itself. The additional targets ChemCam will select and zap over the holidays could significantly aid in analyzing this region. To select a target autonomously, the software uses adjustable criteria specified by scientists, such as identifying rocks based on their size or brightness. The criteria can be changed depending on the rover’s surroundings and scientific goals. Spectrometers on ChemCam (short for “chemistry and camera”) record the wavelengths seen through an on-board telescope while the laser is firing. Using this information, Los Alamos scientists identify the chemical composition of the targets. Data collected from ChemCam has helped quantify elements like hydrogen, boron, and manganese in Martian rocks, which revealed that the Red Planet was habitable in its ancient past. Since the rover landed on Mars, ChemCam has analyzed thousands of rock and soil samples with more than 500,000 total laser shots. 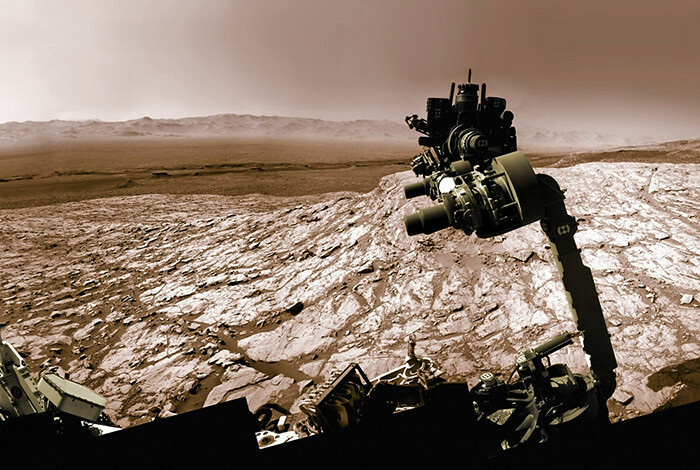 From the top of Curiosity’s mast, the instrument can analyze the composition of a rock or soil target up to about 23 feet (7 meters) away. The autonomous software, AEGIS (Autonomous Exploration for Gathering Increased Science), was developed by engineers at the Jet Propulsion Laboratory. The ChemCam instrument was jointly developed at Los Alamos National Laboratory and the Institute for Research in Astrophysics and Planetology in Toulouse, France. Commands for the instrument are alternately developed and sent from operations centers in Los Alamos and at CNES, the French Space Agency. Los Alamos’ work on discovery-driven instruments like ChemCam stems from the Laboratory’s experience building and operating more than 500 spacecraft instruments for national defense.